Successfully Added Professional Bill Counter- Automatic Counterfeit Detection with UV and MG, LCD Display, Total Count Voice Feature, 1000 Notes to your Shopping Cart. Make sure you always have the right total with the professional bill counter, coming with a counterfeit bill detection. Perfect for a small office or business, the professional bill counter will accurately count your notes — and do that quickly and efficiently while you can focus on other things. While counting money can be quite satisfying, it requiers care and can take a lot of time. Even if you are an experienced cashier, you will still need to double check and triple check the total when you count bank notes — not to mention instances when you get distracted and have to start from the beginning. Well, you no longer have to do everything for your small business. The professional bill counter will take the money counting off your hands, letting you get on with more complicated to-dos. 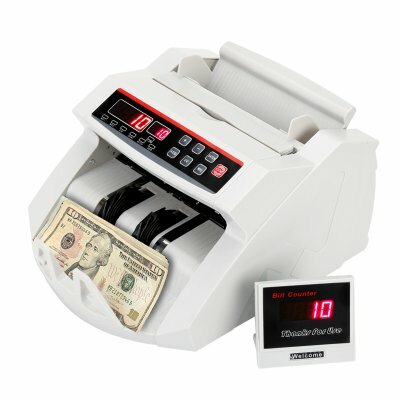 The bill counter can count 1000 notes per minute and will be a great addition to any cashier’s desk or payments office. It’s really easy-to-use and comes with several simple modes for you to choose from. The mini LCD screen will clearly display your total and you won't have to spend time recounting. The external display gives you more flexibility as to where you place the bill counter and lets you easily see the results without moving around. A great feature of the machine is counterfeit bill detection. Coming with UV and magnetic detection, the bill counter will automatically spot fake bills and have you notified. So you won't have to worry about being cheated out of your hard-earned money. So if your working with cash and requier accurace and speed then this automated note counter is the perfect tool for you. The Professional Bill Counter comes with a 12 months warranty, brought to you by the leader in electronic devices as well as wholesale note counters.. There are two levels of MG: MG1 and MG2, MG1 detect the banknotes with low magnetism and MG2 detect the banknotes with high magnetism.